This file contains all relevant informations concerning the meteorological station of the LYCEE CLASSIQUE DIEKIRCH (LCD). . Attention: this file replaces the readme95.html. It does not contain any history or other information concerning the monthly data. These informations are included from January 1996 on as a ten line header in the monthly data file!! version 4.4: 16_Feb_03: CO2 sensor is MIR9000 from Environnement s.a.
typically every minute, with average of 30 minutes stored. 1 TM1 Logger_T [C] Logger temperature, NTC sensor, serves as a check for critical high internal temperatures. ( milli Minimal Erythema Dose per hour) 1 MED/h = 250 J/(m2*h) = 0.06944 W/m2 effective UV_B irradiance This precision broadband instrument is temperature- stabilized at 25 degrees Celsius. Accuracy: within +/- 5% of daily total. Resolution better than 0.1W/m2. [W/m2] Ultraviolet Solar-Light 501A-UVA sensor measuring the UVA irradiance in the [320..400nm] wavelength region. Reading is in [W/m2] (Watt per square meters). Construction is similar to the UVB_Bio sensor; the precision broadband sensor is temperature-stabilized at 25 degrees Celsius. 11 CO2 c(CO2) [ppmV] CO2 concentration of the air, expressed in ppmV (parts per million; 1 volume% = 10000 ppm). Very precise (better than 1%) sensor from Environnement SA. Recalibrated every 3 to 4 weeks. 16 NO2 c(NO2) [ug/m3] NO2 concentration in ug/m3 measured by the AC31M sensor of Environnement SA. Recalibrated every 3 to 4 weeks. 17 NO c(NO) [ug/m3] NO concentration in ug/m3 measured by the AC31M sensor of Environnement SA. Recalibrated every 3 to 4 weeks. 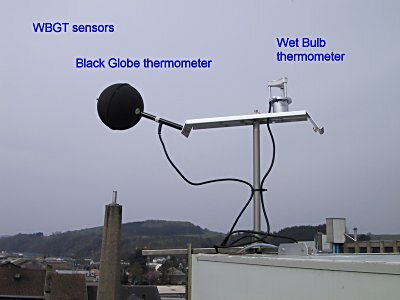 [C] Black Globe temperature sensor for the computation of the WBGT (Wet Bulb Globe Temperature = Heatstress-Index) . Installed 02_May_01. Compute WBGT using the channel Air_temperature sensor from Delta_T. The graphs are made using a Linux system, running GNUPLOT and IMAGE MAGICK and a couple of self-written Perl scripts. A Win98SE computer running AUTOMATE 4 Pro makes the transfer from the logger to the Linux computer (transfer 2 times per hour); the Linux computer makes the daily and global files, creates the graphs and icons and transfers everything via a leased 256kbs line to the Internet provider.